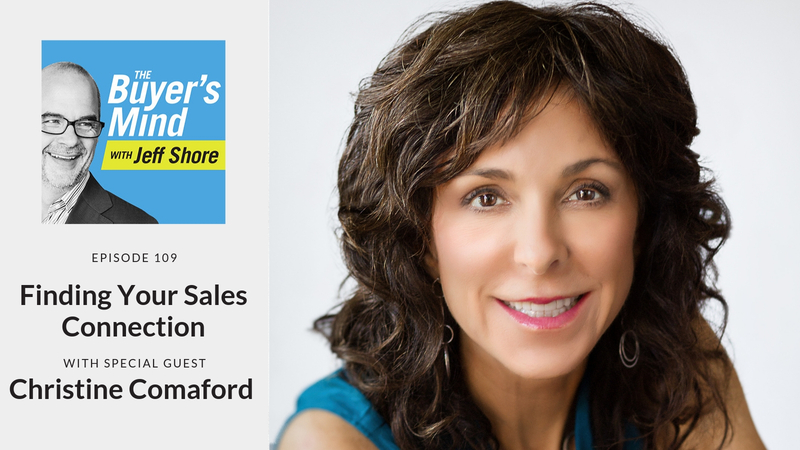 Christine Comaford discusses with Jeff the neurology and psychology behind how your customer connects with you. Sales professionals can forget that their customers are just like them. When we remember how we want to be served, we can serve our customers better. [24:13] Why do people aim so much lower than their potential? Have you subscribed yet? When you subscribe, you’re sent notifications of new podcasts as they come out each week and it helps us to be more visible in the sales community. Click here to subscribe in iTunes! The other thing that helps is writing a review. It gives us feedback about the types of shows we should be creating to help you become the best sales professional possible. We realize it takes a little bit of your time but we’re extremely grateful to those of you who take the time. You can go here to leave a review click here to review, Select View in iTunes and then select “Ratings and Reviews” and “Write a Review.” Your feedback means so much to us, Thank You! For more than 30 years Leadership and Workplace Agility Expert, Serial Entrepreneur, and New York Times bestselling author Christine Comaford has helped leaders navigate growth and change. Christine is sought after for providing proven strategies to shift executive behavior to create more positive outcomes, enroll and align teams in times of change, profoundly increase sales, product offerings, and company value. Christine’s coaching, consulting, and strategies have created hundreds of billions of dollars in new revenue and company value for her clients. The potent neuroscience techniques she teaches are easy to learn and immediately applicable to help leaders see into their blind spots, expand their vision, and more effectively influence outcomes.